For more than 60 years, Adidas has been synonymous with athletic success. That’s because adidas knows how to make athletic gear that gives athletes what they need to be their best. For years now, adidas has been helping athletes improve their performance with the use of its adiPRENE technology, an advanced support system in the sole of its footwear. 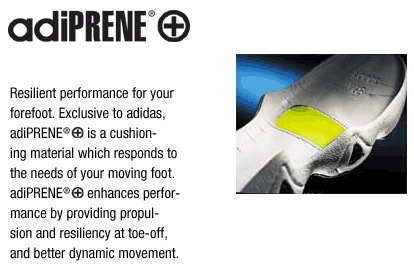 The effectiveness of adiPRENE can be observed through a simple demonstration using a golf ball. You see, adiPRENE performs two distinct functions. Orange adiPRENE absorbs shock, while yellow adiPRENE provides energy rebound. When the golf ball is dropped on the orange (shock-absorbing) adiPRENE, nothing happens. It doesn’t even bounce. But when the golf ball is dropped on the yellow (energy rebound) adiPRENE, it acts like a super ball, bouncing all over the place. This has the same effect on your foot. The orange adiPRENE is placed in the heel, to give cushion and support and comfort, which eases fatigue and keeps you fresh. The yellow adiPRENE is placed in the front of your foot, acting as a spring, which gives you that extra boost in your step, making each step lighter and less tiring. Then somebody asked, why should athletes be the only ones to see their performance benefit from adiPRENE? You need your feet to perform too. Which means you need your work boots to perform. The average construction worker walks nearly four miles every day. That’s nearly a marathon every week. So what if your work boots performed as well as an athletic shoe? Rockport decided to give it a try, and put adiPRENE in its Rockport Works More Energy 6” work boot series. When Rockport tested this out to measure comfort and fatigue levels, it was incredible how much these Rockport work boots with adiPRENE outperformed traditional work boots. As a result, sales of Rockport More Energy work boots were through the roof last year. With that success in mind, this year Rockport is introducing adiPRENE by adidas into its First Advantage tactical series, which means those in law enforcement can now enjoy the same benefits that their friends in the construction industry have come to love. Both will soon be available for you to buy at workingperson.com, so keep your eye out for them!